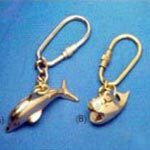 We provide an enamoring collection of unique Keychains that is available in attractive designs, shapes and sizes. Apart from their beauty, our nautical keychains are very useful to hold different keys together. We have firmly positioned ourselves as the most eminent antique keychains exporter and one of the supreme keychains importers, based in India.